Gail writes: I used to love listening to podcasts on my old iPhone, but it died after I dropped it in a pool. 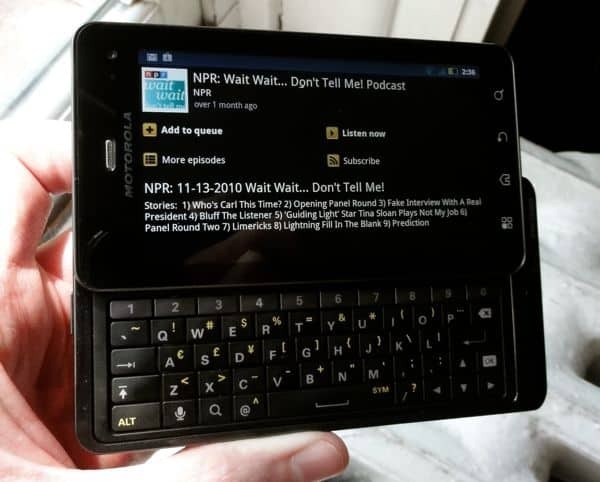 Now I have a new Android phone (the Infuse), but it doesn’t work with iTunes, and I have no clue how to transfer my favorite podcasts to my new phone. Help! Hi Gail! Yes, it’s true: iTunes isn’t compatible with Android phones (although there are a few third-party apps that seek to fix that problem). The good news, however, is that Google’s official podcast app for Android, called Listen, does a great job of managing and storing podcasts directly on your Android handset—and if you ask me, it even improves on the iPod application for the iPhone when it comes to updaing podcasts automatically. You phone should begin to install Listen immediately; once it’s done, open the app launcher again, find Listen, and tap its icon. OK, so what’s your favorite podcast? Let’s say, for example, it’s NPR’s “Wait Wait Don’t Tell Me!” Tap the magnifying glass icon at the top of the screen, type “wait wait don’t tell me,” and press Enter. You should get a list of search results pretty much right away. See the one you want? Just click the entry to bring up a detail page, including a podcast description. Want to play the podcast immediately? Click “Listen now.” You can also download an individual podcast for playback later (“Add to queue”) or subscribe to a podcast (“Subscribe”). Once you’ve subscribed to a few podcasts, tap the Back button (the button with the little curved arrow sitting beneath your phone’s display), then select “My listen items.” Any podcasts you’ve already downloaded will be stored here. Have more questions about Listen for Android? Let me know!